Dogs have such amazing skills! They are easy to train, and a lot of them are so eager to learn. Remember that dog named Norman? We were so amazed when we saw him riding the bike (with training wheels, of course!)! And now another talented dog has caught our attention! 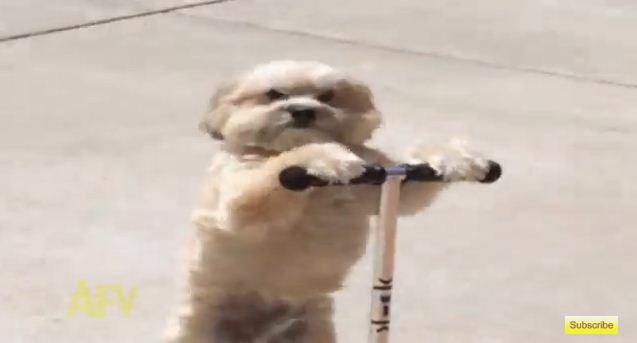 This dog was featured in America’s Funniest Videos YouTube channel because he can ride the scooter like a pro! Yup, he rides it like humans do! Check out the video below and see this dog ride a scooter in the driveway while his family cheers for him! He looks so confident riding it too! It’s just too cute! Isn’t he cute? And he has amazing balance too! Can your dog do something like this? What special talent does your dog have? Leave a comment below and share your videos with us!